I have been receiving a lot of hits on posts about fire front doors. I have previously said that I believe a firefront door is only worth fitting if you already have an existing back boiler in place. If you do not have a wrap-around back boiler, a fire front door is not the best solution. This is because (1) It can can lead to overheating of the chimney breast which, in turn, could lead to cracking of the masonry, and (2) A fire front door - while helpful in some ways, is not economical compared to an inset stove. The Irish made Boru Doras fire front steel door has a price tag of €550, a very high price indeed for a simple steel door. For the same sort of money you can have a very nice quality inset stove. In the course of doing a bit of research for blog articles for this coming winter, I visited some local dealers. 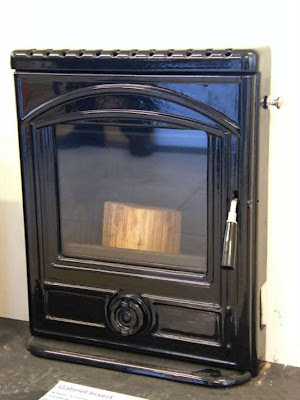 I have been looking at two beautifully cast and well designed inset stoves at McElligotts in Castleisland County Kerry. Both stoves are by the same UK company called Hi-Flame. 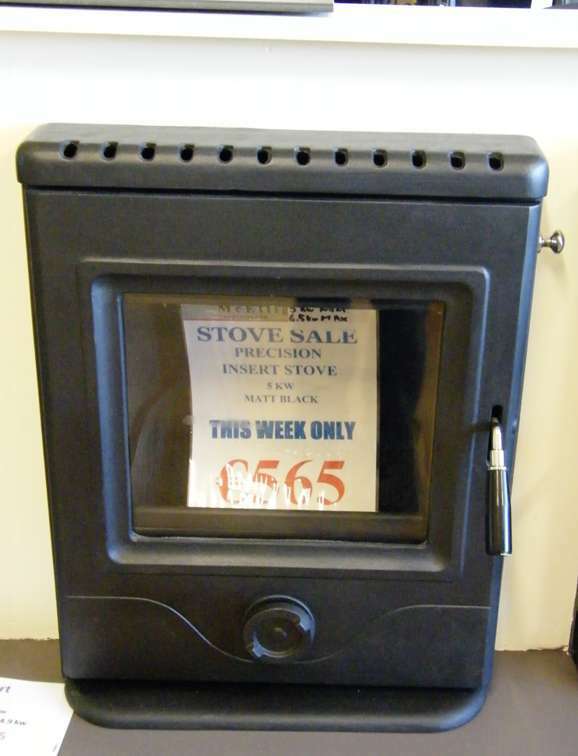 As you can see from the above (not so great) photo, McElligotts have this quality inset stove rated at 4.9 Kw on offer at €565. The top picture is from the brochure and shows the stove in a more elegant setting. I like the plain modern no fuss lines. I cannot vouch for the heat output of these stoves, as I have not had the opportunity to examine working models, but having examined the stoves construction, I can say it follows good design guidelines, it has a very nice quality of materials especially of the cast iron, and it will give results that are way - way far beyond a Boru Doras door, or any other plain fire-front door, is capable of giving, and for much the same sort of money. 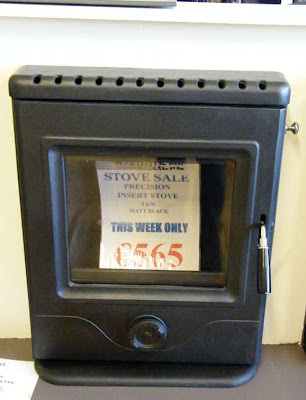 If you have an open fire without a wrap-round back boiler, this should be a very good choice at very reasonable money for a quality and guaranteed inset stove. Fitting costs are generally quite small, as there is no need for flue pipes or for any building work as such. The Hi-Flame insert come in two designs. Above is the second in the series, what you see is the more expensive enamel finish option. 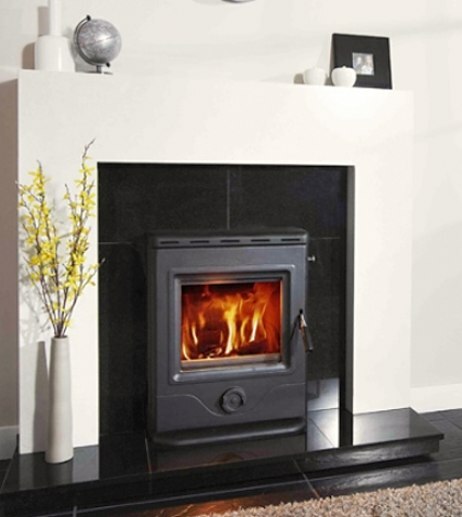 Both stoves have the same heat output rating, and both are the same reasonable price of €565 in plain cast. Both designs are also available in a black enamel gloss finish for about €170 more. Frankly I don't see the advantage of the enamel other than aesthetics, but I'm sure the women will disagree!